Our lives are similar, are they not? We have a myriad of changes that occur all of the time around us. Work changes. Family changes. Priority changes. Political changes. Environmental changes. Health changes. And so on. Some of these changes we control and some we don’t. How well do you accept or react when seasons of change enter your life? I know for me that it depends upon the change. I generally think I am pretty adaptable, but honestly, there are some places that I struggle more with change than others. A good example for me is this blog. When I started it, I had this grand vision of sharing leadership tidbits with folks like you on a pretty consistent basis. It is something I enjoy doing very much. I told myself that I was going to devote a certain amount of time to blogging and even went as far as to list this as one of my key priorities. I did pretty good for about a year, but then some seasons in my life started changing. Work priorities increased significantly and some other priorities emerged in my personal life. Things had changed. But I was still hanging on to the blog as a priority even though I didn’t have time for it. I would stress myself out when I didn’t get a post out on time and was worried about when I would get to the next one. I wasn’t changing with the season in my life. So, I finally had to let it go for a short while. And when I made that change, my ability to adapt and devote my energy to the things I needed to improved significantly. This reprioritization simply was adapting to my environment. Seasons come and go in our lives. Some are short. Some are long. Some require us to change a lot. Some require us to change a little. Regardless, there is one thing you can count on and that is that change is inevitable. Recently I was reminded that one key characteristic of good leader is a “low resistance to change.” And this is definitely true as I look across the leadership landscape of the company and organizations I work around and with. If you can’t handle change as a leader, you might as well hang it up and pass the baton to someone that can. Handling change properly and adaptability are critical components of a leader’s skill set and responsibility. How do you do that? Here are three actions you can take to be a better leader when it comes to change. Recognize It. Leaders have to be able to discern change. They need to understand the environment that they are in and when change is afoot or is required. Leaders need to anticipate change. They need to get ahead of change and prepare for it. This isn’t always possible, but leaders should always be on the watch so that their reaction is elegant and they are un-phased in the eyes of their troops by what’s about to happen differently. Own It. Leaders are required to understand ‘what’ change is required and ‘why’ to the very best of their ability. This means that you may have to dig in and research or ask the right questions to clearly understand the direction or situation. Sometimes things happen rapidly that require an immediate change in direction that the leader can’t explain, and at those times they have to have conviction in their decision making. They must be unwaverying and not wishy-washy. This does not mean inflexible. It means that when your followers look in your eyes, they can see that you believe it, own it and can feel your sincerity and credibility. This also means that they need to be cognizant of the environment around them 360 degrees and encourage and influence others to own and champion the change. This may mean that you have to take a peer (or even their own leader) aside that is being counter-productive and help get them on the right track. Being a leader is an action oriented role. It’s easy to lead when the boat is sailing in a straight line with good winds behind it on smooth waters. It’s a testament to a leader’s abilities when any or all of those factors change. 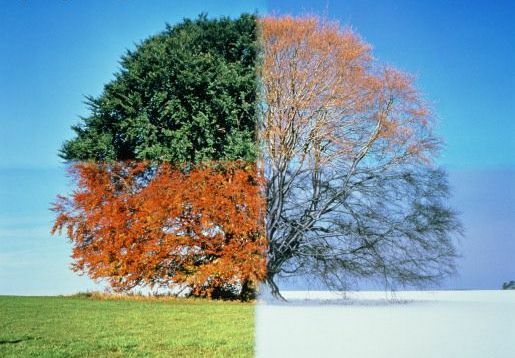 How well do you handle the seasons of change in your life? What do you do to lead change? 2 Responses to Seasons Change. Do You? Thanks for sharing your leadership wisdom and being a catalyst leader. Jason – excellent leadership message and something to always be mindful of. Thank you!